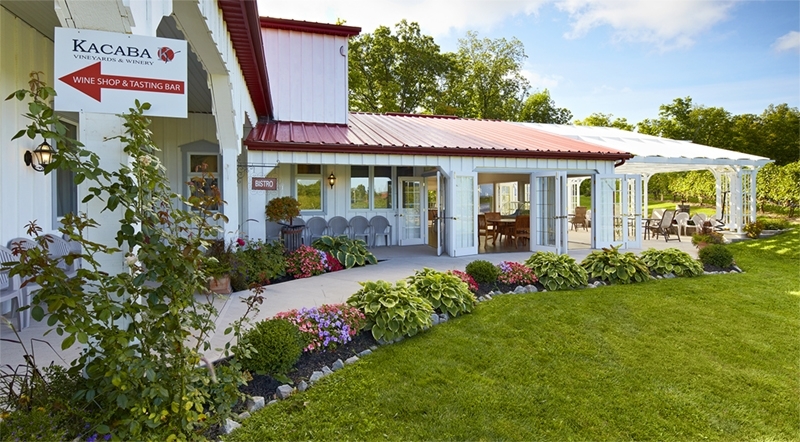 Kacaba Vineyards & Winery is a family owned, a premium small batch winery located on prime bench land of The Niagara Escarpment in Vineland, Ontario. Smaller batch sizes assure that focus is placed on producing wine of Merit. The winemaker's emphasis is placed on creating wines rich in aromas, deep in color and character with velvety finishes. Kacaba wines are produced using only the finest grapes grown on the Kacaba estate or partnered grape growers from surrounding vineyards. If you follow the Wine Route into Vineland, the entranceway leads up a curved driveway lined with sugar maples. A silver bridge spans a ravine terraced and planted with one of Ontario's first major plantings of Syrah. On the other side of the ravine are rows of mainly Bordeaux reds with roses planted at the end of each. Once you are up there, the skyline of Toronto is visible across Lake Ontario.